Opposition politician Chalton Hwende (file photo). 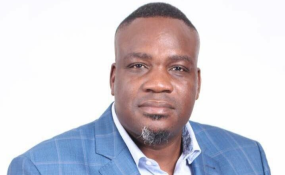 Hwende is facing charges of trying to subvert President Emmerson Mnangagwa's government, after he allegedly posted messages on his Twitter account inciting Zimbabweans to demonstrate against rising economic hardships. Through his lawyer, Harrison Nkomo, Hwende had argued that it's not a crime to complain. But Harare magistrate, Learnmore Mapiye ruled that his complains where "triable issues." "The State should be given a chance to prove its case. The points the accused is raising are triable issues and there is reasonable suspicion that an offence was committed. "The application against placement on remand is therefore dismissed," ruled the magistrate. "Unconstitutional means, consists of coercion. The State is alleging that that there was a call by the accused person in his capacity as Kuwadzana East MP to completely shut down Zimbabwe by staying at home. On what basis does this become an offence?" Nkomo queried rhetorically. "What evidence did the State bring to prove the Twitter account belongs to him? The accused will state that it does not belong to him even though what was posted is not criminal." Nkomo said Zimbabwe subscribes to a constitutional democracy and that his client "simply exercised his rights as a politician." He accused the State of being overzealous. "Everyone in the country witnessed what happened after the message was posted," he said alluding to the violent protests in January that left at least 17 people dead. The State alleges that Hwende wrote that "2019 should be the year of the final push to a New Zimbabwe. We cannot continue on this trajectory of failure and kwashiorkor of leadership. Enough is enough. In January citizens must organise themselves for a complete shutdown of the country." Prosecutors further allege Hwende added that Zimbabweans in 2018 elected opposition leader Nelson Chamisa characterising President Mnangagwa's administration as an "illegal regime." The court heard that between January 14 and 16, 2019 and in response to Hwende's exhortations, members of the opposition, various trade unionists, pressure groups, youth forums and members of the public engaged in violent protests across the country.